Dr. Sue Babich is co-teaching a class this week at the Geneva Spring School of Health. 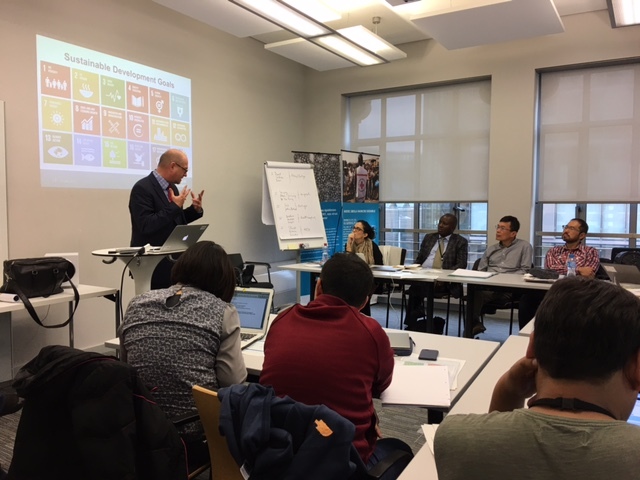 Her teaching partner, Dr. Rudiger Krech, Director, Health Systems and Innovation, Office of the Assistant Director-General of the World Health Organization, is pictured below teaching global health PhD students. Dr. Kathryn Coe recently published, "Cultural Relevance of the Transtheoretical Model in Activity Promotion: Mexican-American Women’s use of the Process of Change," in the Journal of Health Disparities Research and Practice. Hispanic women in the U.S. have disproportionately high rates of obesity and health disparities related to insufficient physical activity. This study examined culture-specific factors used by Mexican-American women for becoming more physically active as they correspond to the theoretical constructs of the Transtheoretical Model. Join the MS Biostatistics Department on April 28, from 1:00-3:00pm, in HITS 3139. Five students will present their theses; Danai Chasioti, Christina Davidson, Scott Dolejs, Yichen Sun and Hao Yi. Thank you all for your participation in IU Day! We'd like to improve IU Day for next year and we'd love to get your feedback. It will only take one to two minutes to complete the survey – we look forward to hearing from you! When disposing of your batteries at work, please use the buckets in the workrooms located on the fifth and sixth floors. The IU National Center of Excellence in Women’s Health is partnering with the Purdue’s Women’s Global Health Institute to bring research to the community. Please join us on May 1 to hear and ask questions from Purdue Professor, Connie Weaver, PhD and IUSM Professor, Linda Anne DiMeglio, MD on their work studying osteoporosis. Register here. The IU Faculty Academy on Excellence in Teaching will host an infromation session on Monday, May 1, at 12noon, in the Psychology Department conference room, LD124. Since its founding in 1989, FACET has served as a model for faculty development, helping shape teaching and learning at Indiana University and beyond. FACET events, programs and services include, among others, the Annual Retreat, the FACET Associate Faculty and Lecturer Conference (FALCON), The FACET Leadership Institute, FACET’s peer review training and peer reviews of teaching, and with the University Graduate School, the Future Faculty Teaching Fellows program. These activities directly address IU’s priorities to serve students and foster student success and to maintain an excellent faculty. You are cordially invited to attend the IUPUI Center for Cancer Population Analytics and Patient Centered Informatics 2017 Symposium. The event will be held at Regenstrief Institute; 1101 W. 10th Street, Indianapolis, IN 46202. It is a full day event from 8 AM- 4 PM, on Friday, May 12, 2017. Dr. Arnold L. Potosky, Professor in the Department of Oncology, Georgetown University Medical Center, and the Director of Health Services Research in the Cancer Prevention and Control Program at the Lombardi Comprehensive Cancer Center. Dr. Potosky is well-known for spearheading the original SEER-Medicare data linkage and currently leads an NCI R01 to study the impact of genomic medicine in women with breast cancer, under age 65, using a linked cancer research database consisting of 5 state cancer registries with complete insurance claims data and Oncotype test results. The team he leads conducts studies that investigate the dissemination and effectiveness of cancer therapies, and use patient-reported outcomes to document decrements in care and guide clinical practice. Dr. Shawna Hudson, Associate Professor and Research Division Chief Department of Family Medicine and Community Health, Rutgers Robert Wood Johnson Medical School. Her current National Cancer Institute funded study Extended Cancer Education for Longer-term Survivors (EXCELS) in Primary Care (R01 CA176838) develops and tests a self-care intervention for cancer survivors in primary care settings that uses a multimedia, web-based mHealth platform (web and smartphone application) supplemented with care management/health coaching. Dr. Kurt Kroenke, Professor of Medicine at Indiana University School of Medicine is well-known to the Regenstrief community. He is internationally known for developing widely adopted patient-reported outcome measures, as well as multiple randomized trials to improve the care of both primary care and oncology patients with pain, depression, and anxiety conditions. With the support of the Patient-Centered Outcomes Research Institute, he is currently studying how best to incorporate patient-centered symptom measures into clinical practice. Dr. David Haggstrom is Associate Professor of Medicine and Director of the IUPUI Center for Cancer Population Analytics and Patient-Centered Informatics. Dr. Haggstrom will discuss research and development activities of the Center, including the linkage of state cancer registry data with the INPC, and a personal health record for cancer survivors, building upon the OpenMRS platform. For more information, please contact Layla B. Baker. The IU Simon Cancer Center will host poster presentations on Wednesday, May 17. Students, fellows, and faculty conducting cancer research at IUPUI, Indiana University-Bloomington, Purdue University, and the Harper Cancer Research Institute, a collaboration between the IU School of Medicine and the University of Notre Dame, will present at Cancer Research Day. Cash awards will be given for best poster(s) in each research category, by group. Cancer Research Day will take place at the IUPUI Campus Center, 420 University Blvd., Room CE 450 (Multi-Purpose Room). Cancer Research Day is an annual event that aims to increase understanding and awareness of IU Simon Cancer Center research endeavors and encourage collaboration with other cancer research institutions in Indiana. And, a special self-care treat for caregivers (lay to professionals) about handling compassion fatigue due to exposure to secondary trauma fo those for whom you care/educate. Join the The People's Food Summit on Saturday, June 3, from 10:00 am to 3:00 pm, at Riverside Park. The Food Summit will bring together the people of the City of Indianapolis and Marion County to develop a comprehensive strategy for addressing problems of limited food access. The Food Summit’s afternoon session will include strategic planning preparation be led by Purdue Extension-Marion County. The session will allow community members to organize themselves, based on their personal interests in the food system, by defined strategic topics. Each strategic working group will develop a vision, mission, objectives, and strategies to create a positive impact on Marion County’s food system. At the end of the summit, the working groups will have scheduled the subsequent three months to formulate a document addressing their strategic topic. By the end of the year, all strategic documents will be compiled to create a county-wide, community-based strategy for food access. Register for The People's Food Summit here.